I have waited much too long for the day when I would get my hands on Doon‘s sequel. 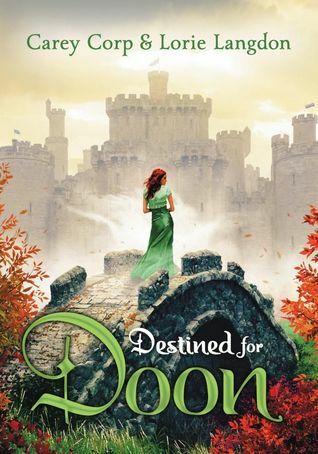 Once upon a time, you know, I reviewed Destined for Doon‘s predecessor and despite the fact that it is way against my personal rules to read anything I’ve written more than over a month ago, I just looked back at it for some reference and I’m not sure if I’m impressed or horrified. Maybe a bit of both. In case you want to know what a delirious girl and Morlocks look like, here you go, though I won’t say I didn’t warn you. I will be honest with you, my loyal reading fans, about Destined for Doon and my overall experience. In fact, I will share with you all my misery. I will give it to all of you in hopes that you can take it away. Can you tell I’ve just finished? I sound pathetic, I know. Let me explain, before you go on to judge me in ways I can only dream of. I got Destined in the mail at three in the afternoon yesterday. I started reading at ten that night. I alternated between reading and sobbing over my keyboard from then on until 5 AM. Don’t believe me? I think I sent a semi sleep-drunk email to Langdon and Corp, so they can vouch for me. They can vouch for me. Looking back at my Doon review, it’s easy to see that I was taken into uncharted territories and I had my mind equally boggled, but I have no idea what it was these two wonderful women decided to do this time around, because from start to finish I was driven absolutely batshit crazy. I’m still emotionally incompetent, if you haven’t noticed. I loved this book. I loved it so hard and now it’s over and I’m crying because the sequel to the sequel isn’t listed on Goodreads and what am I even supposed to do with my life now that it’s over? Do you have any ideas? Probably not. I’m feeling far too many things for my heart to handle. I’m also listening to some really mopey The Naked and Famous songs right now and it is so not helping my case. Did you know I cried myself to sleep last night and I’m not even sure if it’s because I’m sad or happy? Too much information? I know. I thought so, too. But I promised you honesty, didn’t I? Can I tell you all that Duncan and Kenna broke my heart and sowed it back up so many times that I’m not sure I even have a heart left? The tension between these two was unbearably painful and if I told you how many times I cried over the pair I don’t think I’d be able to live with myself. There were also a lot of Westley x Buttercup and Han Solo x Leia mental flashbacks (personal mental flashbacks, though there is mention of Amidala?). Equally heartbreaking, I know. While I’ve always related to Veronica in the sense that I’ve dreamt of worlds I wish existed but don’t, Kenna and I connect more on the level of accepting that reality is the only kind of world we’re going to get and it’s better to face the music than hope for things that aren’t likely to happen. I saw myself in her shoes so many times through the course of the novel, and it was great being able to sympathize, though it did play a big part in all my ugly crying. I loved how Destined for Doon toyed with the whole idea that sometimes our dreams change, or people come in and what we had intended to do in life is suddenly questioned. It was such a beautifully emotional journey for both V and Kenna, and above all else, having these girls back on the pages together was incredibly enlightening. Did you know there’s this song “I Need My Girl” by the National and it’s currently playing on my Spotify playlist and now I’m crying again because what am I even feeling? Here, look, do you want to feel my pain? Yes? No. You probably don’t but I’m going to force feed you anyway so you understand. I’d like to think this is a fitting song for what Duncan felt when Kenna left him at the bridge. *sniffles* Why did you do it, Mackenna, why? I’m fine, okay, I’m fine. Seeing Veronica’s character mature was tons of fun, and I love the idea of her as queen. While her and Jamie’s story isn’t half as harrowing as the opposing couples, I’m ever thankful to my lovely writer friends Carey and Lorie for not making my whole reading experience deliciously torturing. I probably would have had a premature stroke if that had been the case, but nonetheless, the fact that Jamie and Veronica’s relationship was not perfect made me happy because I think something people need to understand is even fairy tale romances aren’t daisies and butterflies all the time. My hope for the future books in this series is that Duncan and Jamie get stuck in the real world, because wouldn’t that be hilarious? I don’t know. It probably isn’t funny. It might just be me. A little emotionally deranged. Also maybe in need of ice cream. I don’t know. The mystery present in Destined for Doon was also hair-pulling and a few of the new Destined were a bit suspicious. There is one particular lass you’ll all meet whom I still don’t trust and I’m willing to put my money down right here, right now that she’s going to end up being some sort of problem child. Also, tension is high because now that ______ has been solved what problem is coming next? Two books. Two. Bad things are going to happen and the thought of that is giving me heart palpitations. Have I mentioned that I’m really looking forward to the third installment? Oh, you can tell? Sorry. I’ll just create a personal Doon therapy group. If you’d like to join my anguish and cry over cute Doonian princes together please do not hesitate to contact me. Doon‘s second installment is just as fun-filled as the first, but with even more twists, turns, and yes, maybe kissing. Previous ArticleTV Review: The Strain 1x8, "Creatures of the Night"